Regular preventive dental care is vital for healthy smiles. But the truth is, access to dentistry is a luxury for many people at home and abroad. Dr. Rick Cofer, the dentist in Waco TX, knows how much of a difference good dentistry can make for people who can’t afford it — and he and the team at Premier Family Dental wants to make the world smile. 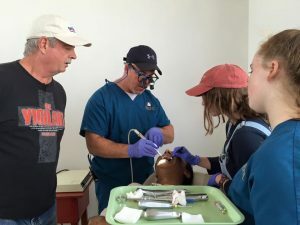 That’s why we were so happy to be included on the First United Methodist Church’s recent mission dental trip to Chincha, Peru! Here, our dental team extracted 285 teeth, applied fluoride treatments to over 1,000 kids, and handed out toothbrushes to the entire community. Chincha is located in the southwestern Ica region, below Lima, the capital of Peru. Just 181,777 people live in the province of Chicha. And as is the case in many other developing countries, there simply are not sufficient resources to provide all Peruvians with the quality dental services everyone needs. This is especially the case in rural areas like Chicha, where Dr. Cofer, Pastor Wayne, and the Faulkenbery family visited. In fact, there’s currently only one dental professional per 9,000 people in Peru. Dr. Cofer and the dental team from Premier Family Dental were recently one more. No matter who you are or where you live, an aching tooth takes a serious toll on your overall quality of life. And if you don’t have access to the dental care you need, that toothache turns into an abscessed tooth that eventually requires extraction. For many of the patients we treated, extraction granted them the relief they needed from their toothaches. Many had lived with dental pain for years. 285 extracted teeth later, we are happy to have helped that many people live pain-free once again. But the dental care wasn’t just focused on extracting teeth — we also protected little smiles from cavities with much-needed fluoride treatments. It’s a quick application that strengthens tooth enamel against the acids and plaque that cause tooth decay. After 1,000 fluoride treatments, we know the children in Chincha are smiling big thanks, in part, to the team at Premier Family Dental. One More Stop in Peru! As much as we feel like we gave to Peru, we know we are bringing that much (and more!) back to Waco. In fact, before we left Peru, we made a stop at Peru Dental in Lima. 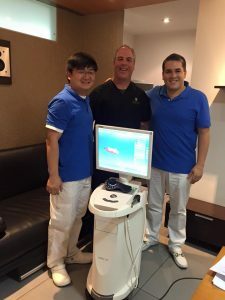 Here, Dr. Cofer received advanced training in CEREC same day dentistry and innovative Ivoclar product techniques. Dr. Enrique Yuen and his team welcomed us so warmly and it was a real learning experience for Dr. Cofer. What a way to end a successful dental trip! Having access to dental care is such a blessing, and it’s one we have here in Waco TX. When was your last checkup and cleaning at Premier Family Dental? Contact us to schedule an appointment with Waco dentist Dr. Cofer. And don’t forget he’s also your cosmetic dentist in Waco! by: Dr. Rick Cofer at August 15, 2016 .